Home » Articles » AFM Pension Reform and Janus vs. AFSCME: Is the Federal Government on the Right Track to Secure Your Future? AFM Pension Reform and Janus vs. AFSCME: Is the Federal Government on the Right Track to Secure Your Future? This month, the AFM Office of Government Relations examines two critical government issues—pension reform and the Janus decision. Pension Advocacy and Security Solutions for pension reform now rest in the hands of the bipartisan Congressional Joint Select Committee on Solvency of Multiemployer Pension Plans (JSC). This committee was established to study troubled multiemployer pensions and come up with solutions to the crisis by the end of November. As the JSC moves on to the next phase of its work, it is time for the AFM-EPF, workers, and retirees to tell the committee their stories. The AFM-EPF trustees have determined that the Butch Lewis Act, introduced by Senator Sherrod Brown (D-OH), would best protect our plan and that the JSC represents the best chance to pass this legislation. This act would make low-interest government loans available to pension funds that face financial challenges. There is still a long row to hoe and changes to the Butch Lewis Act may be necessary to get bipartisan support. It is essential that AFM members make their voices heard in Congress to ensure the JSC produces a solution that helps the AFM-EPF and is fair to pension participants. AFM-EPF trustees continue to carefully study pending and proposed Congressional legislation and work alongside AFM staff to provide important information to Congress, as well as to answer fund participant questions. 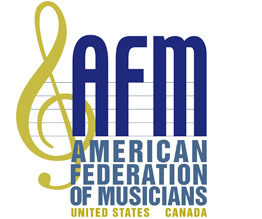 AFM-EPF launched a webpage to connect participants with their members of Congress, as well as with JSC members. Visit https://afm-epf.org/Congress.aspx to: learn about the JSC, identify your members of Congress, plan what to say, call or email your members of Congress, email the JSC, or meet with your members of Congress. AFM-EPF participants can also register at https://afm-epf.org/Registration.aspx to receive the Pension Fund Notes newsletter, which includes regular updates on the JSC’s progress. If you have not visited these sites, I urge you to do so today. It is important that multiemployer pension funds, participants, unions, and employers present a united front in demanding a solution. Acting on rumors can have a damaging effect on our goal to put your interests first. AFM Legislative and Political Director Alfonso Pollard spoke on behalf of AFM President Ray Hair at the Save Our Union Pensions rally in Columbus, Ohio. 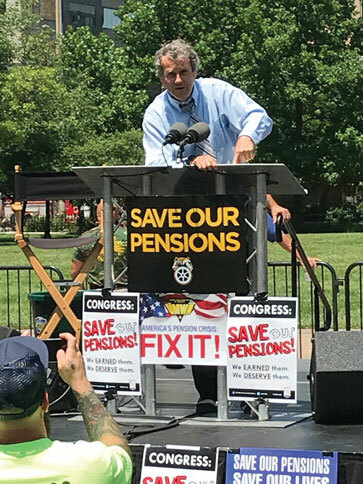 Senator Sherrod Brown (D-OH) speaks about pension reform and the Butch Lewis Act during a Columbus, Ohio, Save Our Pension union rally. 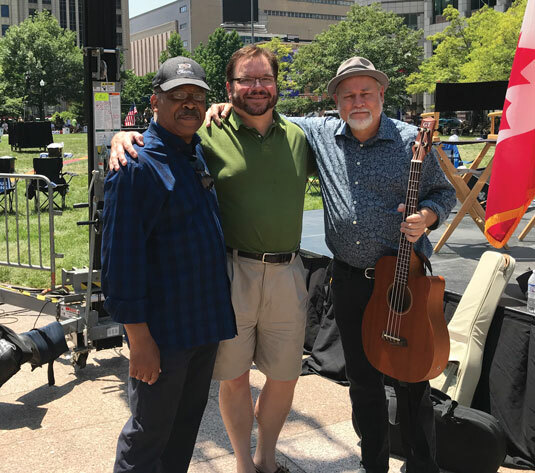 AFM Legislative and Political Director Alfonso Pollard, Local 103 (Columbus, OH) President Doug Fisher, and AFM IEB Member and Local 257 (Nashville, TN) President Dave Pomeroy at the Save Our Union Pensions rally in Columbus. 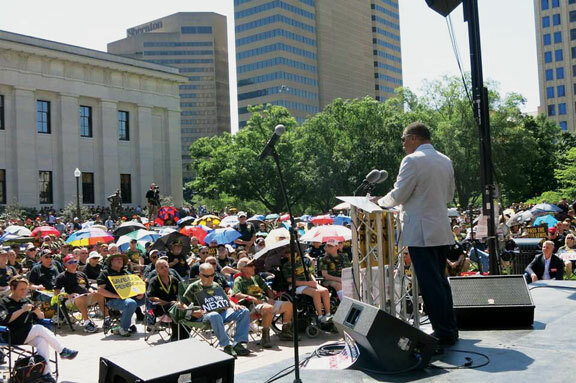 AFM IEB Member and President of Local 257 (Nashville, TN) Dave Pomeroy speaks at the Save Our Pensions rally in Columbus, Ohio. On July 12, at the direction of AFM President Ray Hair, who was occupied at television negotiations in New York City, AFM International Executive Board member Dave Pomeroy (president of Local 257) and I joined more than 10,000 of our brothers and sisters from the United Mine Workers of America (UMWA), Teamsters, AFL-CIO, and other labor unions to raise our voices on the steps of the Columbus (OH) State House. 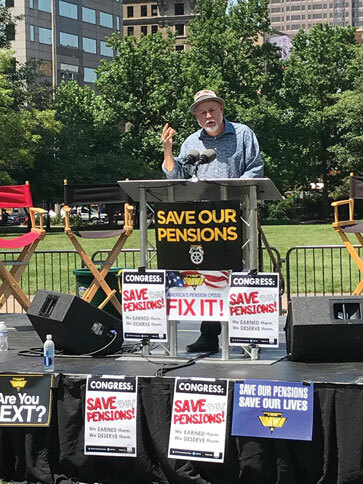 We came together with UMWA President Cecil Roberts to tell personal stories about the importance of our pensions to our families’ retirement security and to urge members of Congress to act urgently. Pomeroy performed labor selections and spoke to the crowd on behalf of AFM members. I stood in for Hair, delivering his remarks. The AFM’s strong participation sent a clear signal of solidarity with our brother and sister unionists—demonstrating that the AFM is an integral part of this battle. On June 27, the Supreme Court of the United States released its long-awaited decision in the case of Janus v. the American Federation of State, County and Municipal Employees (AFSCME). AFSCME is the public sector union that represents state, county, and municipal employees across the country. Mark Janus is an Illinois state employee whose unit is represented by the AFSCME. Under state law, Janus was required, like all other nonmember employees, to pay “agency fees” to AFSCME. These fees are earmarked to cover union expenditures attributable to collective bargaining activities or “chargeable expenditures.” (They may not be used for political and ideological projects or “nonchargeable expenditures”). Janus refused to join the union because he disagreed “with many of the union’s positions, including those taken in collective bargaining.” The Illinois governor filed suit challenging the constitutionality of state law authorizing agency fees. Janus joined as a respondent. The Illinois attorney general intervened in support of the law. Eventually, the District Court dismissed the governor’s challenge, but allowed Janus to file his own complaint. Oral arguments were heard in the Supreme Court February 26 and June 27. The Court concluded its findings and released a ruling on the final day of the 2017 court term. Justice Samuel Alito delivered the Court’s opinion, joined in the majority by justices Anthony Kennedy, John Roberts, Jr., Clarence Thomas, and Neil Gorsuch. The Court found that, because of the shortcomings in Abood v. the Detroit Board of Education (431 U. S. 209, 235–236) (which established the collection of agency fees), “states with public sector unions may no longer extract agency fees from nonconsenting employees.” Justice Elena Kagan delivered dissenting opinion, joined by justices Ruth Bader Ginsburg, Stephen Breyer, and Sonia Sotomayor. This was a seemingly devastating blow to public sector collective bargaining and organizing. The groundswell of opposition came immediately and definitively from AFSCME President Lee Saunders, AFL-CIO President Richard Trumka, AFT President Randi Weingarten, and labor leaders across the country. However, labor had already begun to organize in anticipation. Saunders had prepared his union for the onslaught of attacks from anti-union detractors. Three years ago, he began talking to union fee payers and non-fee payers, making contact with close to one million AFSCME members, apprising them of difficult times ahead should Janus be successful. On the day of the Supreme Court decision, he noted that we should expect Congressional legislation to mitigate the effects of the ruling. At a press conference with House and Senate Democrats, highlighting “Better Deal” labor law reform proposals, Trumka made it clear that organized labor has prepared and is optimistic, saying, legislators are ready to introduce legislation “that will make Janus a footnote in history.” He noted that workers are organizing against this decision. He revealed that 15,000 new members recently joined the union movement in one week, and of the 262,000 new members who joined last year, 75% of them were under age 35. It is up to AFM members to weigh in, when the time is right. We should work to further the notion of solidarity within our workplaces and make clear the danger we face by sitting idly, thinking this is someone else’s problem. 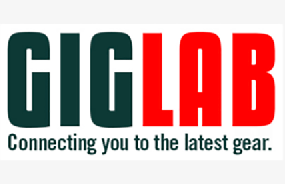 We ask that you remain vigilant now and in the future. Feel free to contact me at apollard@afm.org to discuss any of the details.